It is no secret that human beings have always been searching for a miraculous way to stay young forever – or at least to maintain a youthful appearance and energy level for as long as possible. In a perfect world, a journey to the mythical Fountain of Youth would cleanse an individual of all age-associated ailments. Sadly, Ponce de Leon was unable to locate this legendary landmark, and people worldwide, especially today’s aging baby boomers, continue to scramble to find a cure for the corrosive effects of time. The phenomenon is so widespread that worldwide spending on anti-aging products is predicted to reach nearly 300 billion dollars by 2015, according to a report by Global Industry Analysts. Many expensive – and often highly chemical – products are advertised, with little to no results. However, there is hope! New studies have found that the key to anti-aging has been available in nature all along, in the delicious form of brightly-colored fruits and vegetables, most notably berries. 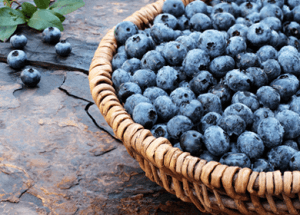 Exciting research results are reporting evidence that berries, especially blueberries, blackberries, strawberries and acai, are crucial for the aging brain. Berries, along with other brightly colored fruits and vegetables, are rich in phytochemicals, which protect the brain from the degenerative effects of aging that may lead to cancer, heart disease and brain maladies. A study published in Neurology recently examined the nutritional habits of 16,010 women over age 70. Those that consumed the most berries had delayed cognitive degeneration by approximately two and a half years. A related study revealed that people who eat at least two servings of berries per week are nearly 25 percent less likely to develop Parkinson’s disease than those who do not. Additionally, berries are brimming with carotenoids such as beta-carotene and lutein, and are currently being studied as to their ability to delay or even prevent amyotrophic lateral sclerosis (ALS), a progressive and extremely destructive age-related disease that tends to develop between the ages of 40 and 70, especially in men. Make a smoothie today with your favorite berries. Not only are berries delicious, but they naturally keep aging at bay and are a sweet way to enjoy a long and healthy life. Previous article5 Ways to Bust Through Your Diet and Exercise Rut! Hey Buddy!, I found this information for you: "Nature’s Candy Key to Anti-Aging". Here is the website link: https://www.thealternativedaily.com/natures-candy-key-to-anti-aging/. Thank you.